Although the fitness industry is always debating the effectiveness of these products, several studies show the amazing benefits of BCAAs. To get the best results in the gym, you need nutrition to be on your side, and the best BCAA for women can give you the nutrition you need to succeed. Most people don’t know about the special nutrients that can optimize training and fitness results, and if you want to unlock your true potential, it’s a good idea to start with BCAA products. 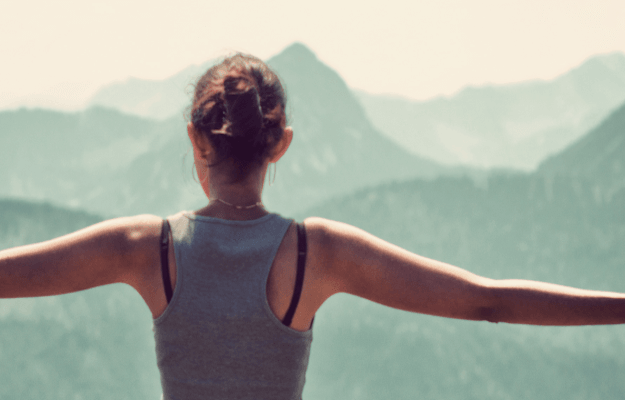 What Are BCAAs For Women? Before buying supplements, you should know what BCAAs are and why they’re important. Also called branched-chain amino acids, BCAAs are very popular within the fitness industry, and they play an important role in your daily nutrition. These products contain the three essential BCAAs, which are valine, isoleucine and leucine. The reason why it’s important to get these nutrients from a supplement is because your body can’t make them. Aside from supplement products, you can only get BCAAs from legumes, nuts, yogurt, milk and meat. Dairy is known to contain a higher concentration of these essential nutrients, and if you’re not getting enough of them, you’ll find it much harder to build muscle and replenish your energy. Put simply, BCAAs are crucial components for recovery and performance. By making sure you’re getting plenty branched-chain amino acids, it will become much easier to accomplish your fitness goals. The first essential BCAA is called leucine, and since it’s responsible for stimulating your body’s protein synthesis mechanism, it’s liked more than the other nutrients. The second major BCAA is called isoleucine, and it helps increase glucose absorption within muscle tissue. The third BCAA is called valine, and it serves as the building block for a variety of important enzymes. Most women work out because they want to burn fat, build toned muscles and increase strength. BCAA supplements won’t magically build muscles for you, but when combined with training and hard work, they’ll make it much easier to accomplish your fitness goals. One of the major benefits of using these products is increased lean muscle mass. When your muscles are worked during training, they’re broken down by the body and must be repaired. The process that your body uses to rebuild muscles is enhanced when you’re using BCAAs. It’s very important for your muscles to get the nutrients they need to grow, and BCAA supplements help supply your muscles with these nutrients. Many studies show that leucine directly influences muscle development, and by supplementing with BCAAs, you can maximize your results from the gym. According to the latest studies, consuming BCAAs before and after strength training reduces soreness. There is nothing wrong with a little bit of soreness because it’s evidence that you got a great workout. However, excessive soreness can disrupt your regular fitness routine, and BCAAs help to combat this problem. Supplements that contain BCAAs can be very beneficial when combined with regular exercise, and they offer several advantages for recovery and training. You can view BCAAs as the building blocks of muscle, and they represent nearly 35 percent of your muscle tissue. For molecular growth to occur, these nutrients must be available within your body, and if you’re going to purchase the best BCAA for women, you should know how much to take. The best results will come from following the recommendations on the product label, but it’s also useful to have a general idea of how much to take. As a general guideline, you should consume between four to eight grams of BCAAs before your workout, and you should use about the same amount when you’re finished with your training session. Smaller amounts can be effective, but to get the most benefit from the supplement, you should take the recommended dosage. By consuming BCAAs immediately before cardio or strength training, you can maximize the results that you’ll get from the supplement. Most women prefer to consume these supplements with a post-workout recovery drink or meal. It’s also a good idea to avoid consuming BCAAs with other amino acids because they’ll push other amino acids out of the way when entering your body. What to Look for in a Good BCAA Supplement? When shopping for the best BCAA supplements for women, it’s important to know what to look for. You should always check the product to make sure it contains the proper ratio of nutrients. In most cases, the best ratio for women is 2:1:1. Another factor to consider is the classification of the blend. You should watch for proprietary blends, and the top products should disclose all the ingredients that are used to create the supplement. You deserve to know what ratio you’re getting for your money, and by selecting products that disclose all the ingredients, it’s easy to check the value. Before making a purchase, you should determine the price per serving, and when you choose products that show ingredient information, you can quickly determine the estimated cost per serving. The total BCAA ratio and content are other things to consider, and depending on your personal preferences, it might be useful to find out if the product is natural. Some women prefer to take supplements that don’t contain artificial colors and sweeteners, and by carefully examining the label, you can check for these ingredients. Some of the best BCAA supplements are formulated with creatine, beta alanine, citrulline and glutamine, and these are beneficial additives and amino acids. It’s true that BCAAs can be very helpful when you’re trying to build lean muscle and get into shape, but if you’re using these supplements, there are some things to avoid. One of the major mistakes that women make when consuming BCAAs is reducing protein intake. After purchasing and using these products, it’s quite common for people to assume that they don’t need as much protein. Although these supplements contain the three essential amino acids for muscle growth, they won’t compensate for an inadequate protein intake. Even if you’re taking a BCAA supplement, you should still consume plenty of protein and make sure you’re getting most of it from whole food sources. Another mistake that people make is dropping their BCAA supplement and choosing a product that only contains leucine. Since many companies have started producing supplements that contain only leucine, some people have dropped their old supplements in favor of these newer products. It’s true that leucine is a crucial amino acid, but for the best results, you need a supplement that contains the three major BCAAs. The final mistake to avoid is taking your BCAA supplement at the wrong time. For maximum results, you should consume the supplement before and after your workout. 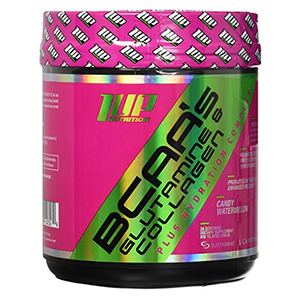 One of the best BCAA supplements for women is from 1 UP Nutrition, and the blend of ingredients has been specifically formulated for women. This product will help your body stay hydrated, and it also helps with the recovery process. The 1 UP Nutrition Her BCAA’s contains SUSTAMINE, and it delivers a combination of essential amino acids. To help your body recovery after a workout, this product contains L-Glutamine and L-Alanine, and it even promotes stronger joints and performance. The blend of ingredients within this supplement help to promote protein synthesis, strength and growth, and the formula is made for rapid absorption and digestion. The hydration complex is a major selling point for this BCAA supplement because it replaces lost fluids and electrolytes. The high-quality ingredients will help repair damaged muscle proteins and replenish your body’s energy supply. Since this supplement is designed for women, it’s available in raspberry lemonade, pineapple and candy watermelon. Although this product is for women, it can also help men achieve similar results. 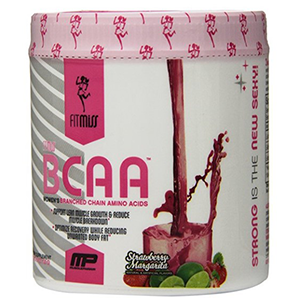 Another top BCAA supplement for women is the Fit Miss BCAA 3:1:2, and the flavor of this product is strawberry margarita. This bottle contains 5.6 ounces of powder, and it contains specific amounts of each of the three BCAAs. The formula contained within this supplement is designed to help women build lean muscle mass, and it can even help with fat loss. When consumed properly, this product supports the growth of lean muscle and prevents muscle breakdown. The BCAAs contained within this supplement can help you accomplish your fitness goals, and they serve as a crucial foundation for thousands of athletes. Each bottle contains 30 individual servings, and the instructions say to consume three scoops per day. For maximum results, you should use this supplement about 40 minutes before and after your workouts. 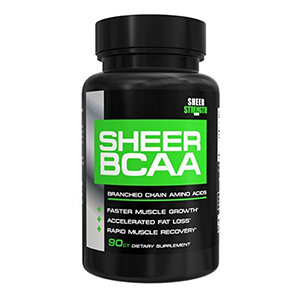 Here we have a popular product from Sheer Strength Labs, and with the purchase of each bottle, you’ll get 90 BCAA capsules, which is enough product for 30 days. If you’re looking for a way to build muscle faster, then this supplement is worth considering. The BCAAs contained within this product are known to stimulate the body’s protein synthesis process, and they can help you add muscle fast and effectively. The ratio of BCAAs can also help you recover faster and reduce excessive soreness. This formula inside of this product is very potent, and BCAAs aren’t all created equally. In fact, the ingredients in many supplements are derived from low-quality sources, but the products from Sheer Strength Labs are made with the best ingredients. When used at the recommended dosages, this supplement is great for women, and it can help you burn fat faster than you could without it. BCAAs are known to protect muscle tissue and stimulate the fat burning process. IdealLean is one of the best BCAA supplements for women, and it can help you build lean muscle mass while burning fat. Each bottle contains 30 servings, and each serving contains 310mg of BCAAs. For maximum results, this product contains a variety of other ingredients, which will boost your energy and improve your performance in the gym. 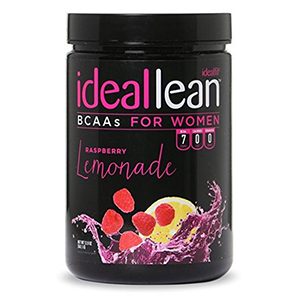 Like many other BCAA supplements, IdealLean doesn’t contain any calories, and the 2:1:1 ratio is ideal for women. This product contains a special blend of ingredients for fat loss, and with the new formula, it works well for muscle building and fat loss. Hydration is also very important when working out, and with the addition of coconut powder, this supplement will help you stay hydrated and energized. If you’re someone who’s serious about building muscle, but you’re not trying to get too big and bulky, then IdealLean offers the BCAAs that can help you succeed. 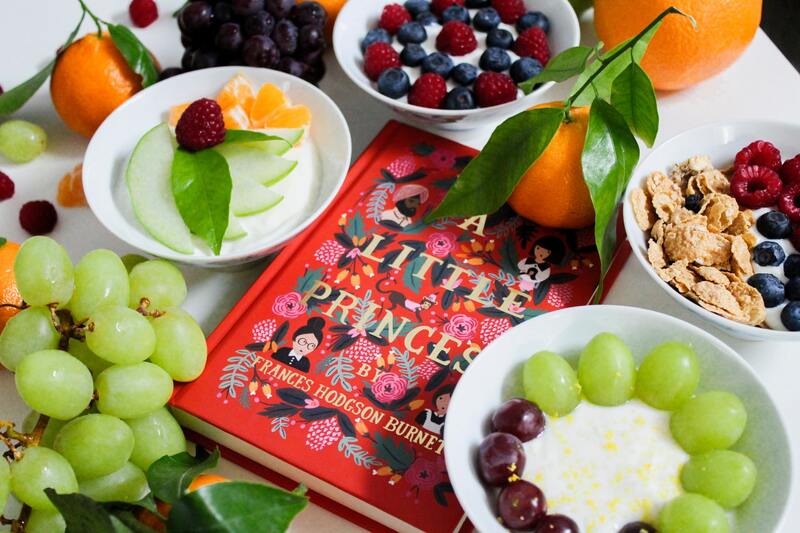 The problem with many men’s supplements is that they contain large amounts of calories, and as a woman, one of your main goals is to avoid excess calories. IdealLean contains the ratio of BCAAs that you need for growth and doesn’t fill your body with unnecessary calories. 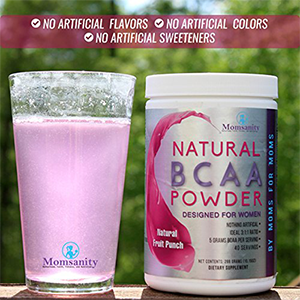 Another popular BCAA supplement for women is the Natural BCAA Powder by Momsanity, and as the name would imply, this product can work wonders for moms. Each bottle comes with 40 servings, and a single serving contains about 7.2 grams of powder. This product is sweetened with natural flavors, and unlike some other BCAA supplements, it doesn’t contain artificial sweeteners, dyes or preservatives. With the flavor of fruit punch, the powder tastes great, and if you don’t like it, you can get a refund. The main reason why this supplement works so well for women is because it’s made by moms and designed for the average mother. It features a BCAA ratio of 3:1:1, and it’s made from only the best ingredients. BCAAs are essential for muscle growth, and since your body can’t make them, supplementation serves as a great way to make sure you’re getting enough. With help from the best BCAA supplements for women, you can make sure your body is receiving the optimal ratio of BCAAs, and you can enjoy the benefits of improved performance, enhanced recovery and faster fat loss.